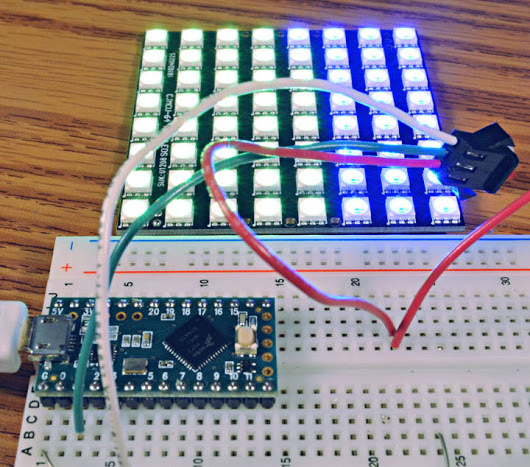 For those who missed this like me, +Paul Stoffregen wrote a DMA version of NeoPixel driving on Teensy chips. I’m assuming the Teensy Serial port is more capable than some other platforms where this is probably not possible (or maybe it is on some other platforms too? I already checked that the 16bit arduinos can only do serial up to 230400, so it’s not fast enough). +Paul Stoffregen, is that a driver you can offer to +Daniel Garcia and +Mark Kriegsman as in help integrate in FastLED if you have a chance? I was always surprised that Teensy was not as well supported in that regard than ESP32, but I guess with OctoWS2811 there was less of a need. That said, this DMA driver is timely because I had just realized that Teensy did not support driving SmartMatrix + FastLED WS2812B, but now it can, even a bit of extra integration in FastLED would be awesome. By the way, ESP8266 also has a DMA driver (single channel) that abuses the I2S output: https://github.com/JoDaNl/esp8266_ws2812_i2s/ (not in FastLED though, but usable out of tree if you don’t need the FastLED APIs). Thanks to +Louis Beaudoin for the pointer.